In a few rare cases (Shakespeare, Hudibras) stressed ˈcontemplate in 16–17th cent. ; also by Kenrick 1773, Webster 1828, among writers on pronunciation. Byron, Shelley, and Tennyson have both modes, but the orthoepists generally have conˈtemplate down to third quarter of 19th cent. ; since that time ˈcontemplate has more and more prevailed, and conˈtemplate begins to have a flavour of age. This is the common tendency with all verbs in -ate. Of these, the antepenult stress is historical in all words in which the penult represents a short Latin syllable, as acˈcelerate, ˈanimate, ˈfascinate, ˈmachinate, ˈmilitate, or one prosodically short or long, as in ˈcelebrate, ˈconsecrate, ˈemigrate; regularly also when the penult has a vowel long in Latin, as ˈalienate, ˈaspirate, conˈcatenate, ˈdenudate, eˈlaborate, ˈindurate, ˈpersonate, ˈruinate (Latin aliēno, aspīro, etc.). But where the penult has two or three consonants giving positional length, the stress has historically been on the penult, and its shift to the antepenult is recent or still in progress, as in acervate, adumbrate, alternate, compensate, concentrate, condensate, confiscate, conquassate, constellate, demonstrate, decussate, desiccate, enervate, exacerbate, exculpate, illustrate, inculcate, objurgate, etc., all familiar with penult stress to middle-aged men. The influence of the noun of action in -ation is a factor in the change; thus the analogy of ˌconseˈcration, ˈconsecrate, etc., suggests ˌdemonˈstration, ˈdemonstrate. But there being no remonstration in use, reˈmonstrate, supported by reˈmonstrance, keeps the earlier stress. Based on this information, I thought that the rare verb altercate must have used to have a pronunciation with stress on the second-to-last syllable. But I've had some trouble finding material that supports my guess. The Oxford English Dictionary gives the present-day pronunciations as "Brit. /ˈɔːltəkeɪt/, /ˈɒltəkeɪt/, U.S. /ˈɔltərˌkeɪt/, /ˈɑltərˌkeɪt/" and has a note saying "N.E.D. (1884) also gives the pronunciation as (æ·ltəɹkeit) /ˈæltəkeɪt/" (which is interesting, but doesn't answer my question). About that strife-begetting question, Sin ! Annoyingly, the verb doesn't seem to have an entry in John Walker's Critical Pronunciation Dictionary of 1791, although Walker evidently was familar with it since he uses it in the definitions of "to chop" and "to stickle" (though the "stickle" definition doesn't seem to have originated with Walker, as it can also be found in Sheridan's dictionary and Johnson's dictionary). The 21st edition of Nathan Bailey's Universal Etymological English Dictionary (1775) gives the stress on the first syllable. Does anyone know of any evidence for stress ever falling on the second syllable of altercate in the past? I'm thinking the most likely place such information would appear is in old dictionaries or poems. The OED's earliest citation for the verb is from 1530. 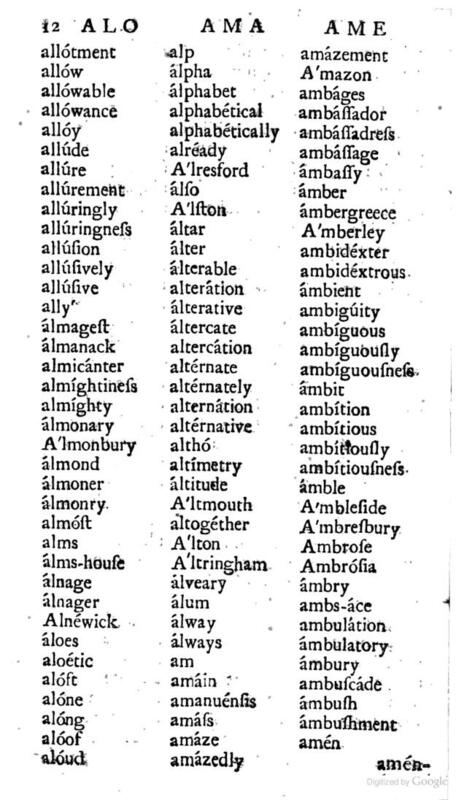 Samuel Johnson’s dictionary of 1755 has no entry for altercate, but tantalizingly does have one for the verb alternate, where he indicates the stress on the second syllable (like alternative), adducing a citation from Milton where the meter suggests that pronunciation. The entries for the adjective and noun are also instructive. Not the answer you're looking for? Browse other questions tagged verbs pronunciation historical-change early-modern-english stress or ask your own question. What determines the stress of an adjective formed by adding “-ive” to a verb ending in “-ate”? Can the stress pattern of “uroboros/ouroboros” be explained by any principle, or is it random? How is “cyan” pronounced and where is the stress? How has “Boadicea” been pronounced at different points in history? is first syllable stress on “frequent” becomming the norm for verb form?